Our company is engaged in offering an excellent rage of Pellet Cooler that is known for service life, superlative functionality and corrosion to resistance. These are widely used for reducing the temperature of hot pellets from pellet mill to ambient temperature. The coolers basically work on the principal of blowing air through columns of hot & moist pellets, resulting in evaporation of moisture from the pellets. We offer the Pellet Cooler in various customized specifications and is ideal for all kinds of pellets material. 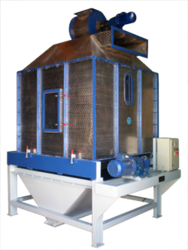 We fabricate a wide array of Counter Flow Pellet Cooler (Counter Current Pellet Cooler) that can be customized as per the specific requirements of our individual clients. Offered at economical prices, these counter flow pellet coolers can be offered in bulk quantities and in a short span of time. Used for cooling hot pellet to ambient temperature in order to avoid the problem of fungal growth during pellet storage.